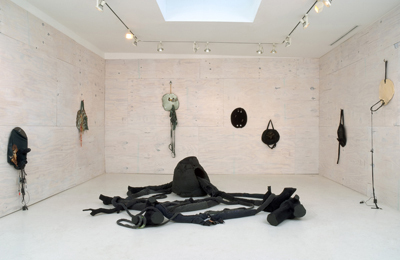 View of “hook & eye.” On walls, from left: Mask, Display, Two-Eyes, Om, Exploded, Held, and Speech (all 2007). Foreground: Circuit, 2007. The materials on the checklist of Anna Sew Hoy’s first solo exhibition in four years (and her first at Karyn Lovegrove) read like the inventory of a garage sale or a craft carnival, but she pulls them together into delightfully strange sculptures that mix the handmade with the conceptual—more punk-rock Louise Bourgeois than feminist Martha Stewart. Sew Hoy’s exhibition, titled “hook and eye,” consists of thirteen ceramic wall hangings suspended from whitewashed plywood walls that encircle a freestanding sculpture made of denim, logs, flocking, and foam. The hangings blend craft with distinctly twenty-first-century detritus that celebrates traditional feminine forms while intentionally subverting their use value. Sew Hoy fires ceramics that aren’t pots and knits together fashionable clothing that could never be worn, all of it reveling in its artful uselessness. As much as the designer jeans and computer cords used in these postfeminist sculptures reference the most recent, gaudy, and wired chapter of capitalist development, they also engage the modernist avant-garde’s conflicting obsessions with primitivism and the “purity” of sculpture. The minimalist slabs of clay, each hanging from a resin cast of a human finger, are poked with holes and adorned with phallic outcroppings. The metaphoric heart of the show is the central piece, Circuit, 2007. Though not representational, the sculpture’s dozen tentacles—made mostly from black denim rudely cut from jeans and stitched together like Dr. Frankenstein’s creation—call to mind a mutant creature newly emerged from some postapocalyptic soup. It’s a primordial ooze of consumer-culture throwaways. Sew Hoy’s work has always been playfully pop, but this exhibition adds something dark and heavy to her polyglot practice.